Our mission is to close the volunteerism gap that exists in our community by connecting volunteers with charitable causes. We recruit, manage and train volunteers seeking opportunities to give back to their community through non-profits. We use fundraising events to highlight local non-profits and connect our volunteer community to organizations in need of help to further their missions. Learn more. 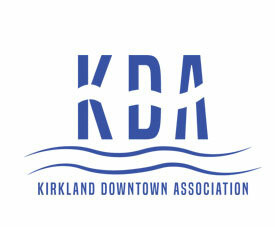 The KDA is a 501(c)3 non-profit organization representing the common interests of Kirkland’s downtown business community. KDA members include business owners, property owners, and members of the community who are dedicated to the vibrancy of Downtown Kirkland. They support each other, provide funds, and volunteer hours to promote community events which encourage people to visit, shop, live, work, and play in Downtown Kirkland’s unique waterfront setting. The KDA actively supports the City of Kirkland and the Kirkland Chamber of Commerce efforts in business recruitment, growth, and development. Learn more. Kirkland, WA's official guide to our city's many art galleries, fine restaurants, lodging, and other tourism attractions. Learn more. The Kirkland Heritage Society’s mission is to identify historic resources; to encourage their preservation; to collect, preserve, exhibit, and interpret the history and heritage of Kirkland and its people; and to promote public involvement in and appreciation of its heritage and cultures. Learn more. A non-partisan political action committee in Kirkland focusing on promoting the Kirkland Business Community. Along with our memberships, the Kirkland Business Community works together for the betterment of Business, Community, and Lifestyle. Learn more. KIN is a 501(c)(3) all-volunteer organization registered with the Charities division of the Washington Secretary of State’s office. Every dollar donated to our projects is used to help poor and needy individuals and families; our low overhead expenses are paid by the dues of our member congregations. Our congregations and the community at-large provide the resources we need for the work we do. KIN does not receive any government funding, and we do not use paid fundraisers. Learn more. Kirkland Arts Center unleashes the power of art to ignite individual growth and self-expression, build community spirit, and cultivate cultural vibrancy. Learn More. The Kirkland Cultural Arts Commission is a volunteer board that works to help arts, culture, and heritage grow and thrive in the City of Kirkland. Along with supporting art and cultural initiatives throughout the year, the Cultural Arts Commission advises the City Council on art acquisition and promotes strategic arts planning in Kirkland. Learn more.